I have always been a big fan of highlighters. I have tried many brands and lucky me, all suited my skin well without making me look like a disco ball. I have oily, acne prone skin but yes with a healthy glow to it. A good highlighter helps in enhancing your features. I am always in search of something that gives a healthy and radiant look. 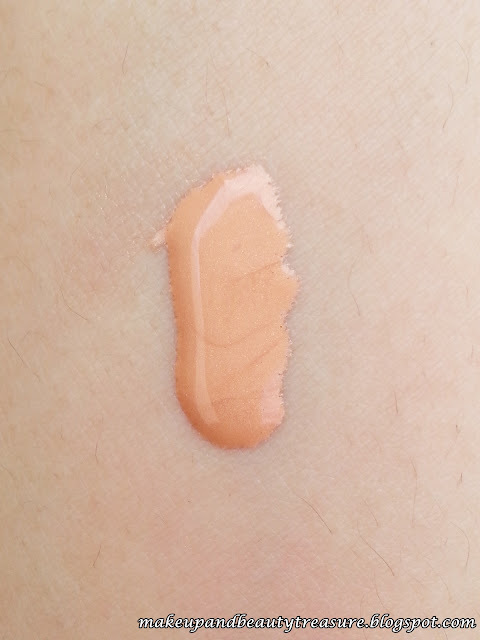 I came across Revlon Skinlights Face Illuminator Lotion in 'Peach Light' and today I am going to share my experience with it. Revlon Skinlights Face Illuminator Lotion comes in a sturdy pinkish beige colored pump tube with a silver colored pull off lid. On opening the lid, there is a white pump dispenser which makes the illuminator really easy to use. It allows you to control the amount of product without wasting. The pump tube is not squeezable and hence is safe to carry around in a makeup bag without any fear of leakage or spillage. The smell of the illuminator is mild and wont bother people with sensitive noses. 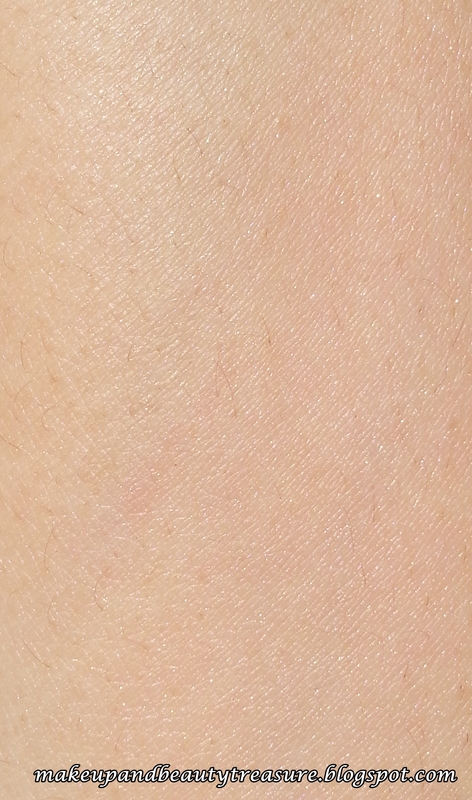 The texture of the illuminator is soft and smooth with a right consistency. It is neither very thick nor very runny. It can be used in a variety of ways. I use it as a highlighter after applying foundation. Apply it onto your cheekbones, collarbones, brow bones, bridge of the nose and cupid bows. 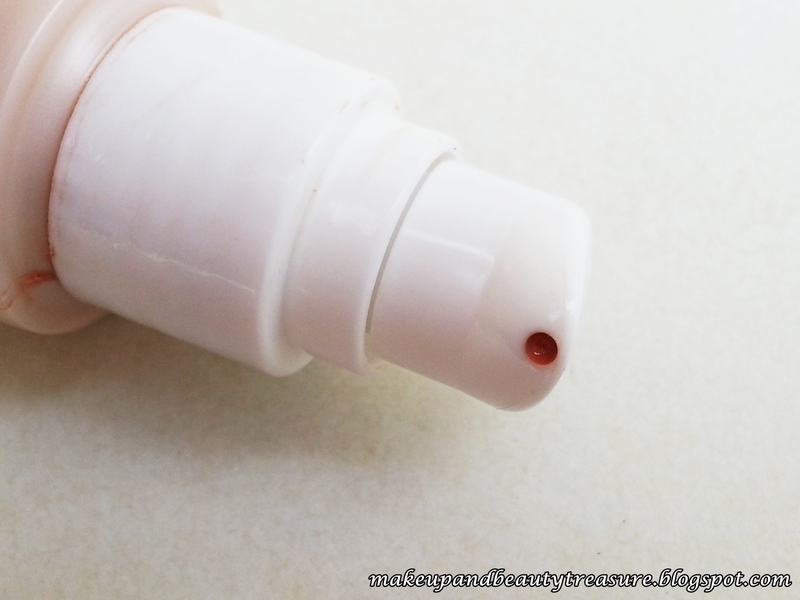 It blends effortlessly without being patchy or blotchy. It makes my skin look more awake giving a healthy and radiant look. it contains very fine shimmers (you can say light reflecting particles!) that doesn't look OTT and give a natural and healthy look. I sometimes mix a pump of illuminator with my liquid foundation for an all over glow. It makes my skin look radiant and dewy. I usually use it this way when I have to attend a night function as I feel it makes my oily all the more shiny and oily during day time (especially in hot and humid weather!). I also mix it with moisturizer to get a natural and radiant look. if you have blemishes or pimples make sure to conceal them first as it provides sheer coverage. You can also wear it on its own for a natural glow but always remember less is more when it comes to illuminators or highlighters to avoid looking like a disco ball. 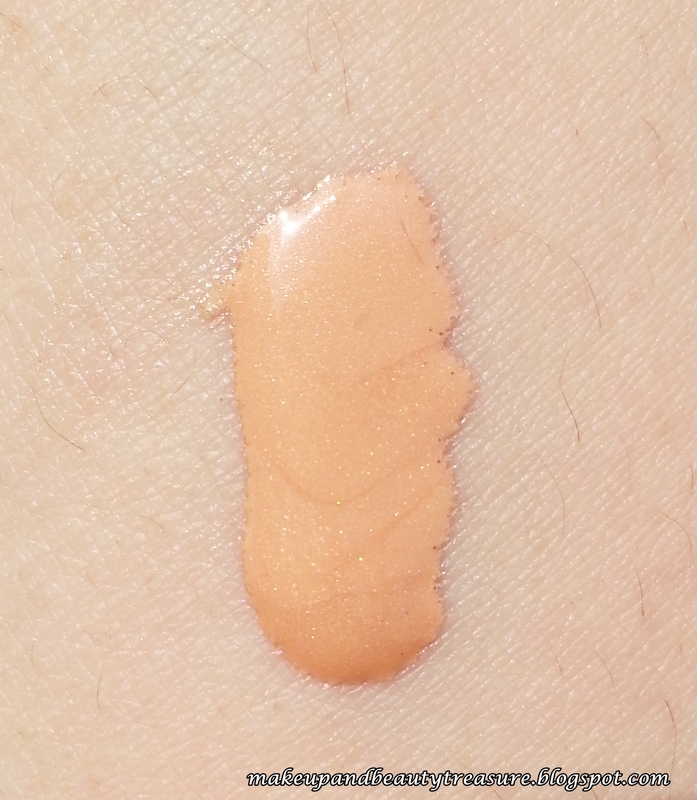 The illuminator doesn't feel heavy or greasy on my oily skin. Although it has SPF 15, I always make sure to apply a good sunscreen before stepping out in the sun. The staying power is pretty awesome. It stays put on my oily skin for a good 5-6 hours after that it starts fading evenly. if you have extremely oily skin make sure to apply powder lightly on top of it. it would last ages with me as only a tiny amount of illuminator is needed for each application. It doesn't cause any irritation to my sensitive skin. It is easy to remove using a good makeup remover. 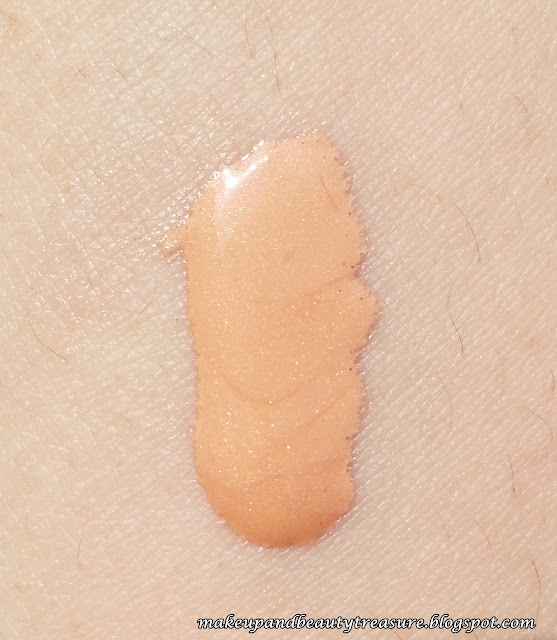 'Peach light' is a peachy beige color with very fine light reflecting or radiance boosting particles. The particles are not OTT and are visible only when light reflects. It makes the skin look luminous and dewy but if you have enlarged pores then it would not be a good bet for you. It can be used at any time of the day for a natural and healthy look. I think it would suit fair to medium skin tones. • Travel friendly and easy to use packaging. • Contains radiance boosting particles. • Makes my skin look radiant and awake. • Gives dewy not greasy look. • Doesn't break out my skin. • Might not look good if you have enlarged pores. 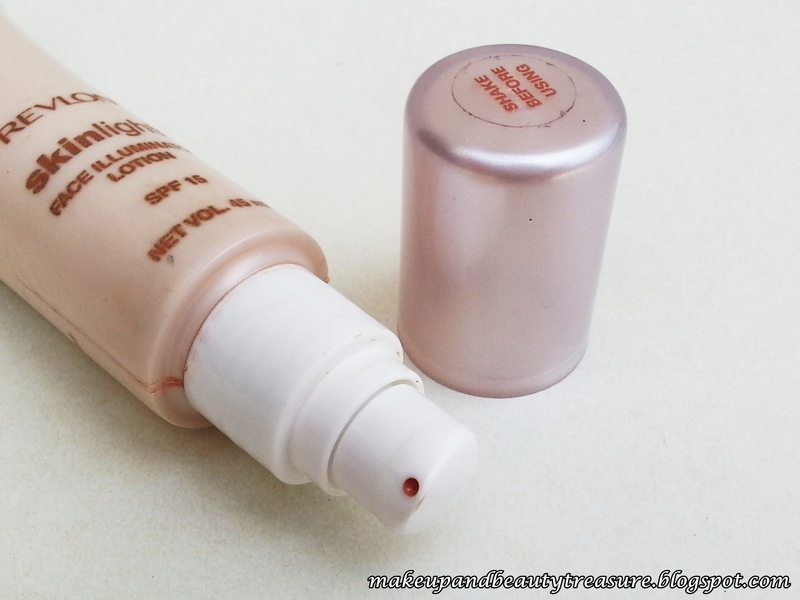 Revlon Skinlights Face Illuminator lotion comes in a pump tube packaging which is easy to use and travel friendly. 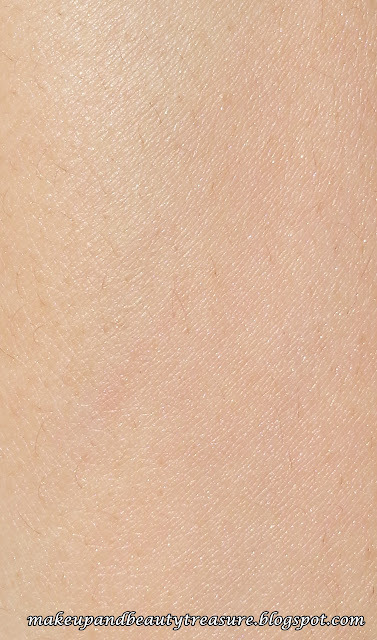 It has soft and smooth texture and blends effortlessly into the skin. it can be used as highlighter, can be mixed with foundation or moisturizer for an over all glow or can be worn on its own. It gives my skin a natural, healthy and radiant look. 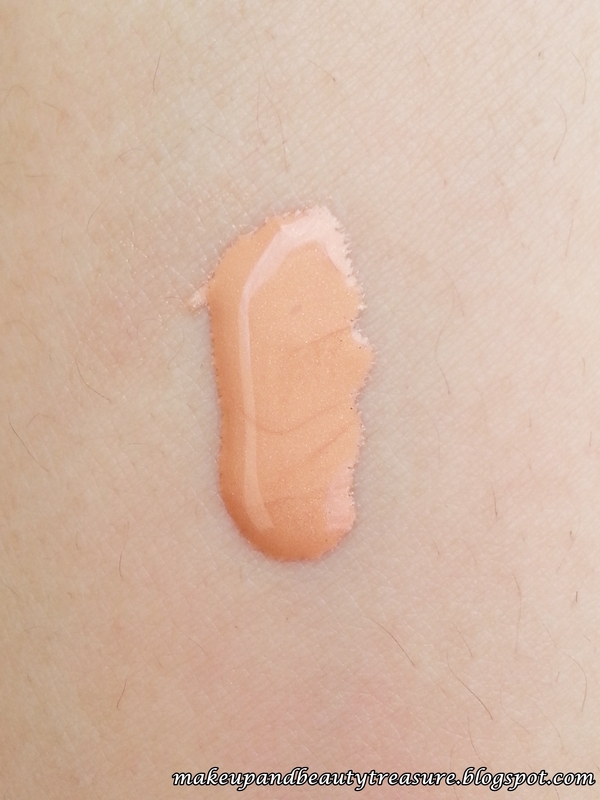 peach light is a peachy beige color that matches my skin tone well. it contains radiance boosting particles which are noticeable only when light reflects on it. It doesn't look shiny or greasy but if you have extremely oily skin make sure to powder your T-zone well. I shall definitely recommend it to everyone. 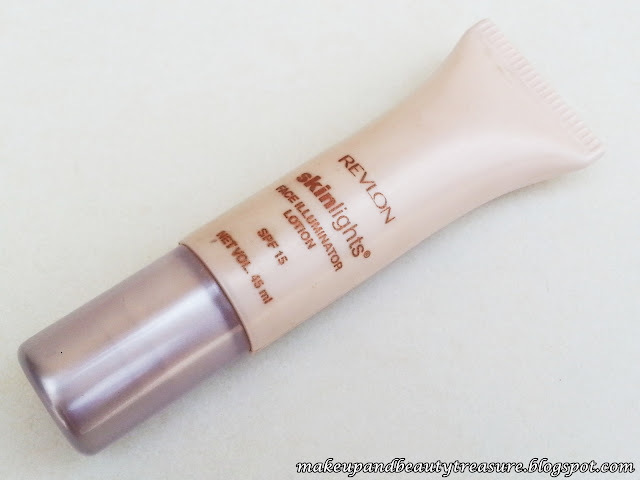 Have you tried Revlon Skinlights Face Illuminator Lotion? How was your experience? Share in the comments below! The shades are too confusing. I think pink light n peach light are for fair to medium skintones. U should have at least one highlighter in ur vanity. It really makes a diff. Try using cream highlighters Prachi! This one n metaliglow r not drying at all. U can try these. i almost forgot this product in my kit, I love it but i only find it useful for evening use, as th shimmer in it is not very forgiving in harsh sunlight. Aaah try using it sparingly with moisturiser or tinted one. Ull love the effect. Great product, I like that it's oil-free and I would like to try it! Wow..nice product megha...n nice review as well...peach light is v nice colour will definitely get it..
Yeah get it soon n let me know how it flares on u. Ya try to get it. It is worth every penny. Sure would love to participate! Good review! I haven't use any illuminated yet but I think it's worth a try. Seems like a good product..
Good review, good yo told that It might not suite aged skin with large pores. Yeah it would just settle down in pores or fine lines! Never used it as a primer. 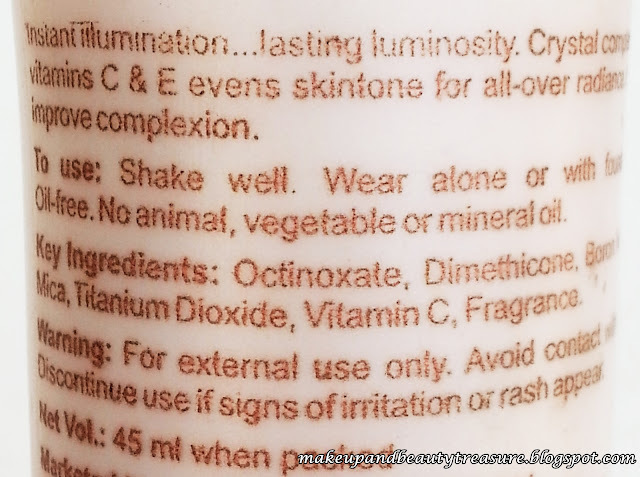 I dont think illuminator wud work well like that.